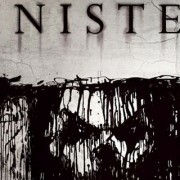 Child-eating demons put Ethan Hawke through a different kind of Training Day in Scott Derrickson’s Sinister. Jason Blum–producer of Paranormal Activity and Insidious–and writer-director Scott Derrickson of Hellraiser: Inferno infamy bring viewers a creative take on the found footage genre by pitting Ethan Hawke against the child-eating pagan deity Bughuul that actually gets its evil power from found footage (Continued after the pic). Ethan Hawke’s character, Ellison, is a true crime novelist who hasn’t had a bestselling novel during the ten years since his last hit book Kentucky Blood (which is talked about in the film INCESSANTLY) was number one on the New York Times Bestsellers’ list. In a desperate attempt to write another hit novel, he moves his family into a home in rural Pennsylvania where a grizzly unsolved murder/kidnapping took place. While moving in, he discovers a box of spoooooooky Super 8 film reels with a haunted projector, all of which contain the creeeeepy footage of homicides first thought by Hawke to be the recordings of a seventy-year-old serial killer. 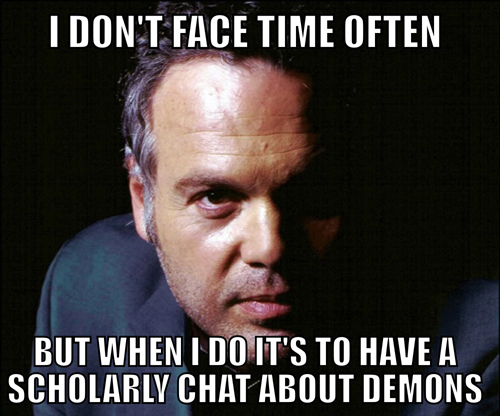 But after a half a bottle of whiskey he discovers the pagan symbols and face-pics of the demon deity Bughuul, all explained to him over iChat by the special guest cameo and “actor’s actor” Vincent D’Onofrio, a.k.a. Detective Robert Goren of Law and Order: Criminal Intent (Continued after the pic). You could gather all of this from the trailer, but if you’re an avid horror fan, you may find the story creative, but the plot is predictable and the scares are weak mainly because Derrickson uses the standard haunted house story–a la Poltergeist, Amityville Horror, and Don’t Be Afraid of the Dark,– to repackage the found footage plot without pushing any boundaries. The movie is more thriller than horror and only frightening if you’re a thirteen year old girl who is secretly crushing on Ethan Hawke who’s about 98% Ethan and, at best, only 2% Hawke (that’s my Ethan Hawke rating system. If he’s more Ethan than Hawke he’s not fun to watch on screen, or very badass. For example, in Training Day he starts out at about 90% Ethan and 10% Hawke, and then by the end of the film he does a complete reversal and nearly goes 100% Hawke. However, a lot of Ethan can be good in some roles like his role as a space adventurer in The Explorers in which he starred with fellow bird boy, River Phoenix, may he rise from the ashes amen…I thought of that during the film). I had a lot of time to think between interesting plot points and mediocre scares when the family was trying adjust to the new creepy house, the kids were getting toyed with by demonic entities and the incredibly artistic shots of Ethan Hawke’s character setting up the haunted projector before getting drunk and trying not to get aroused while watching Bughuul’s snuff films. Bughuul lives in pictures and film and can jump in and out of the screen. Ellison’s house never has lights on. 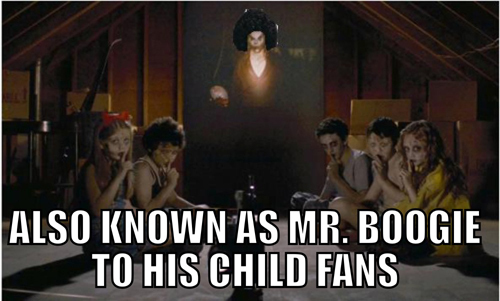 Seriously, the real twist at the end of the film is one of the better parts, but it can wait to be viewed when Sinister becomes available on Netflix. The only thing truly sinister about this film is that I’ll never get my five dollars back for a movie that’s basically a high-budget, R-rated episode of Are You Afraid of the Dark?.